Prime Minister Samdech Akka Moha Sena Padei Techo Hun Sen and his spouse Samdech Kittiprittbandit Bun Rany Hun Sen paid this morning a visit to disabled soldiers and their families at Samdech Techo Hun Sen Kulen 317 Disabled Soldier Development Centre in Siem Reap province, on the occasion of the Khmer Traditional New Year. Speaking at the event, the premier encouraged the soldiers with disabilities not to lose hope, stressing that they are physically, but not psychologically disabled. “Therefore, we need to continue living in this developing society, especially for the future of our children,” he said. 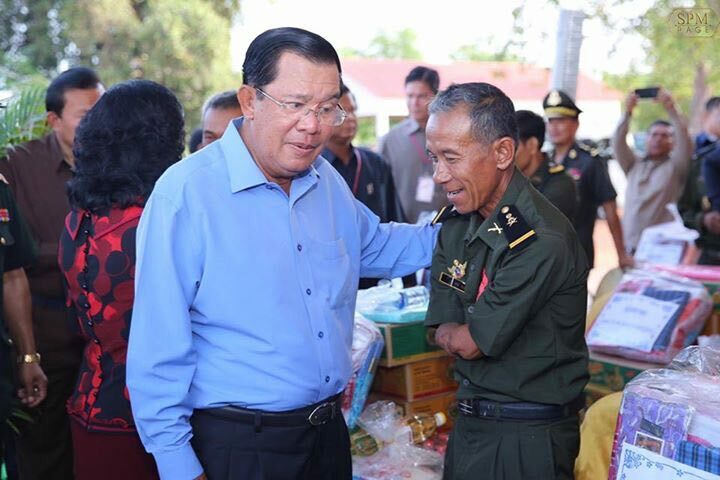 Besides, Samdech Techo Hun Sen appealed to wives and children of the disabled soldiers not feel ashamed as no one wants to become disabled by pointing out that he himself is also a disabled person for the cause of national liberation from civil wars. He further highlighted the Royal Government of Cambodia’s high attention to the soldiers with disabilities. On the occasion, Samdech Techo Hun Sen gave donations to the disabled soldiers and their families, and the centre’s teachers and students, and announced to provide a new school building of two stories and 12 rooms, along with sports facilities to the centre. Inaugurated in 2011, Samdech Techo Hun Sen Kulen 317 Disabled Soldier Development Centre is located in Balaing commune, Banteay Srey district. It is home to 230 families of disabled soldiers, 18 families of voluntary teachers, and 2 families of voluntary midwives. The centre is also composed of a school, a health centre and a pagoda.